Dubai, UAE, May 30, 2018: Her Majesty's Consul General to Dubai and Northern Emirates H.E. 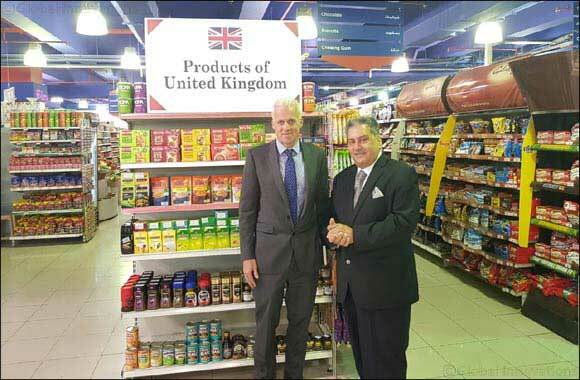 Andrew Jackson, who has just taken over as Consul General visited Al Maya Supermarkets in Dubai. Mr Kamal Vachani, Group Director, Al Maya Group welcomed the Consul General at their Supermarket situated at Murooj Complex, Dubai. HM Consul General toured the Supermarket and was impressed with the products display at Al Maya Supermarkets. Mr Kamal Vachani introduced the Al Maya Supermarkets business and its other operations to Her Majesty's Consul General. During the interaction, Mr Kamal Vachani informed HM Consul General that Al Maya regularly send representatives to FMCG trade shows/exhibitions in UK for sourcing new product range from United Kingdom for our Supermarkets and also for distribution in the UAE & Middle East. Mr Kamal Vachani also mentioned Consul General about the visit of British delegations to Al Maya Supermarkets during Gulfood and interaction with the delegation for many years. Al Maya Group has been importing a wide range of British food products, like Diary products, Snacks and Confectionary, Butchery ingredients, Fresh juices, Canned food, Oil & Vinegar, Cereal & Long life Milk, Tea, Coffee & Jam, Baking & Flour, Pickles & Sauces, Health food, Baby Food and House Ware & Gift articles, informed Mr Kamal Vachani. Al Maya Group has completed 35 years of operation in the Middle East has become one of the largest FMCG Distribution companies and has a sizeable share of the UAE retail market, within which it operates over 50 Supermarkets / Hypermarket and continue to expand further in the GCC. Al Maya Group also one of the leading FMCG distribution company in the UAE.